ONE OF A KIND RARE! I WILL BE LISTING MANY MORE ONE OF A KIND BOOKS BY STAN LEE! Presented here is an AMAZING SPIDER-MAN #1. On the front cover by legendary Marvel mastermind and Spider-Man creator Stan Lee, with Lee also adding an. 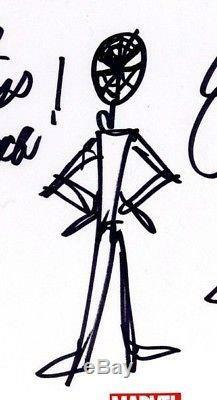 Extraordinarily rare full body sketch of Spider-Man. WITH GREAT POWER COMES GREAT RESPONSIBILITY! A very rare thing indeed, on this one of a kind and the rarest of any of all his sketched books, he actually dated it on the day that he created it with. Dates from Stan Lee are unbelievably rare! While Stan Lee is a wonderful creator of comic concepts and stories, he was never an artist and has been reluctant throughout his career to render any drawings. That being said, Spider-Man sketches from Lee are extremely rare and are scarce to find! The autograph, spider-man sketch, date, and quotes on this unbelievably rare comic were executed in the presence of a CGC representative! 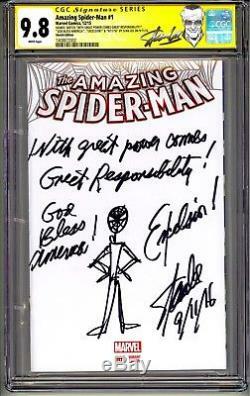 This book has the coveted Stan Lee signature series caricature label and carries the 9.8 NM/MINT grade. This book is guaranteed to be 100% authentic by CGC! Just a little history on this book. I've been collecting comics for decades and met Stan Lee for the first time in 1992. After reconnecting with him years later, I became very interested in the original drawings and comments he had created on comic book covers. 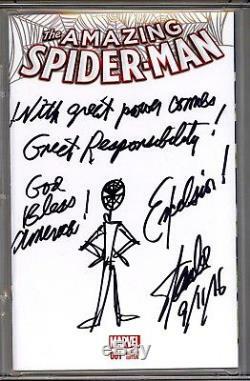 One day I came up with the idea to have a single book created, drawn, and signed by Stan with a Spidey sketch and the quotes, dates, and comments you now see on this book. Originally I was told that Stan was no longer doing any sketches and that he never would! Not for any price ever! Due to his failing eyesight and age. However, after much persistence and considerable funds being spent, this book was created! 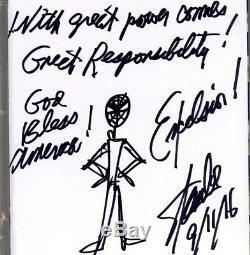 THIS ONE OF A KIND STAN LEE ORIGINAL ART COMIC IS THE APEX BOOK OF BOOKS! IT TOOK ME A YEAR TO BRING THIS BOOK INTO EXISTENCE!! 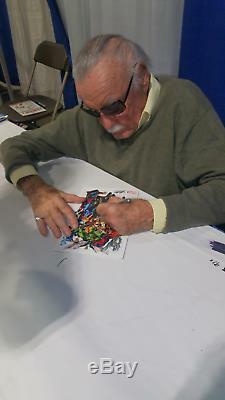 THE STAN LEE TEAM LET ME KNOW THIS AT ONE OF THE PRIVATE SIGNINGS WE HAD WITH STAN!! I personally think this book belongs in a museum and it is a testament to Stan Lee and his love for his fans that really made this book possible. DON'T MISS OUT ON YOUR CHANCE TO ACQUIRE. 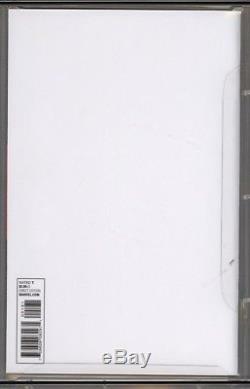 RAREST STAN LEE ORIGINAL ART COMIC BOOK EVER! STAN HAS PASSED BUT HIS CREATIONS WILL LIVE FOREVER!! HE'S THE AMAZING MAN BEHIND SPIDER-MAN AND THE ENTIRE MARVEL UNIVERSE!! HE'S THE GENIUS MASTERMIND THAT ORIGINATED THE COMIC BOOK HEROES IN SO MANY OF TODAY'S BLOCKBUSTER MOVIES!! HIS COMIC BOOKS HAVE BECOME THE BASIS FOR MANY OF THE SCRIPTS THAT HAVE NOW BEEN BROUGHT TO LIFE ON THE BIG SCREEN!! DON'T MISS OUT ON YOUR CHANCE TO HAVE THIS UNIQUE SIGNED "POINT OF CONTACT". WITH STAN "THE MAN" LEE!!! THIS IS A BEAUTIFUL BOOK AND SHOWS VERY, VERY WELL! THE WINNER WILL RECEIVE THE EXACT BOOK PICTURED ABOVE! TAKE A GOOD LOOK AT THE PICTURES.. WOW, THIS IS A COOL BOOK! A MUST HAVE FOR THE TRUE COLLECTOR AND. A GREAT INVESTMENT COMIC IN THE MARVEL UNIVERSE! BOOKS LIKE THIS ARE A CORNERSTONE IN THE INDUSTRY AND CAN CONTINUE TO RISE IN VALUE EVERY YEAR! Someone MUST be there to sign for this book!! I will be listing many more unique Comic Books in the near future. (coming from a non-smoking environment). 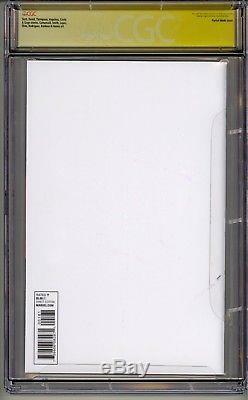 The item "AMAZING SPIDER-MAN #1 CGC SS 9.8 STAN LEE SIGNED SKETCH DATE QUOTE COMMENT 1/1" is in sale since Wednesday, November 14, 2018. This item is in the category "Collectibles\Comics\Modern Age (1992-Now)\Superhero\Spider-Man". The seller is "stockdoc777" and is located in Boca Raton, Florida. 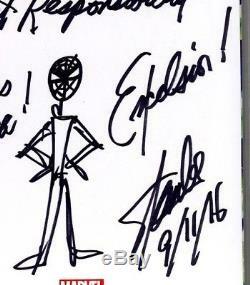 Modification Description: ORIGINAL ART, DATE, QUOTES, AND SIGNED BY STAN LEE. ONE OF A KIND AND TOTALLY AWESOME! GREAT INVESTMENT COMIC--THERE NEVER HAS BEEN AND THERE WILL NEVER BE ANOTHER BOOK LIKE THIS ONE!! UNIQUE STAN LEE ORIGINAL ART AND DATE!! : VERY DIFFICULT TO OBTAIN--SUPER RARE! !